Edamame is young soybeans, usually still in the pod. Because the beans are young and green when they are picked, edamame soybeans are soft and edible, not hard and dry like the mature soybeans which are used to make soy milk. 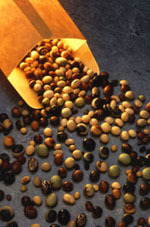 The soybean or soya bean is a species of legume native to East Asia, widely grown for its edible bean which has numerous uses. The plant is classed as an oilseed rather than a pulse by the UN Food and Agricultural Organization. ELMA is the European Lecithin Manufacturers Association, representing major producers of lecithin in the European Union. ELMA was founded in 1999 and has since the onset had the mission of representing the European lecithin industry towards European institutions and other International bodies, while linking its members together in a network of expertise on lecithin and its derived products. ELMA seeks to improve knowledge about lecithin’s usefulness in different applications and provides factual information about lecithin to interested parties across Europe, such as consumers, journalists and authorities. Lecithin is mostly a mixture of glycolipids, triglycerides, and phospholipids. However, in biochemistry, lecithin is usually used as a synonym for pure phosphatidylcholine, a phospholipid which is the major component of a phosphatide fraction which may be isolated from either egg yolk (in Greek lekithos – λεκιθος) or soy beans from which it is mechanically or chemically extracted. ELMA Membership is open to producers of lecithin based in the European Union. Lecithin producers in non-EU countries may become associate members. For more information about ELMA or lecithin, please contact the ELMA secretariat. ELMA posts news and position statements as they arise. If you are looking for specific information that you do not find in this section or with in the rest of the site please use the Contact page to make an enquiry.